In my opinion, the “dilemma” of leftover prime rib is a problem I’m glad to have. It’s perfect in quesadillas, cheese steak or even au jus sandwiches. But now I have a new favorite dinner featuring the succulent leftovers, a Leftover Prime Rib and Gnocchi Skillet. Leftover Prime Rib, a tasty problem to have! Whether we have a lot of prime rib roast leftover or just a slice a two, it’s always a tasty ‘problem’ in our house. Some people don’t like leftovers, but we love them! Our teen boys make leftovers into lots of different meals. I cook with the aim of having leftovers, so there’s always food to eat. I stopped buying snacking food and just started buying more real food. I feel like it fuels up growing kids so much better than emptier calories like chips or crackers. While the water for the gnocchi is boiling, heat olive oil or butter in a skillet. Add leftover prime rib and quickly sautée with red peppers, or ANY other veggies you want to use or need to use up. 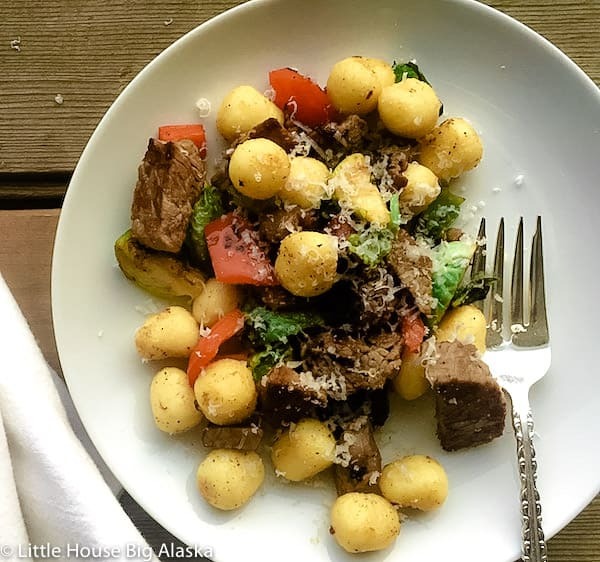 Once the gnocchi are cooked you toss everything together and top it with grated parmesan. Seriously this skillet is so quick and easy and tasty everyone will appreciate it, and you can make it in UNDER 25 minutes, really more like 15 minutes. And kids can make it for dinner too! 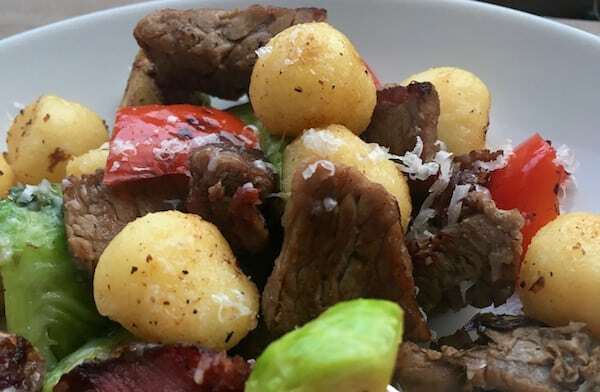 Any leftover beef will work in this recipe. Think leftover steaks, leftover short ribs, and leftover roast beef, even a pot roast would be fine. I happened to have leftover prime rib roast from Christmas dinner, so I used that. You know me, use what you’ve got! If you want to give it a little extra flavor, you could add a dash of Worcestershire sauce or serve it with a creamy horseradish sauce. 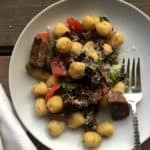 Leftover prime rib is perfect in quesadillas, cheese steak or even au jus sandwiches and now I have a new favorite, Prime Rib and Gnocchi Skillet. If you LOVE Quick and Easy Dinners be sure to check out ALL of my 25 Minute Dinners. These are the quickest of the quick. Feature lots different recipes and get dinner on the table in record time. Yes, even the first time around! Oh hello…this is one dinner I would totally rush home for in a heartbeat!! !